On Sunday, when most of the country is suffering from the deep freeze, we here in Southern California have had the luxury of enjoying the high 70’s all week which mean it’s the perfect day for a ride! Sorry, I just had to rub it in. So the Ranch Rider decided to head out to Pioneertown for the day. 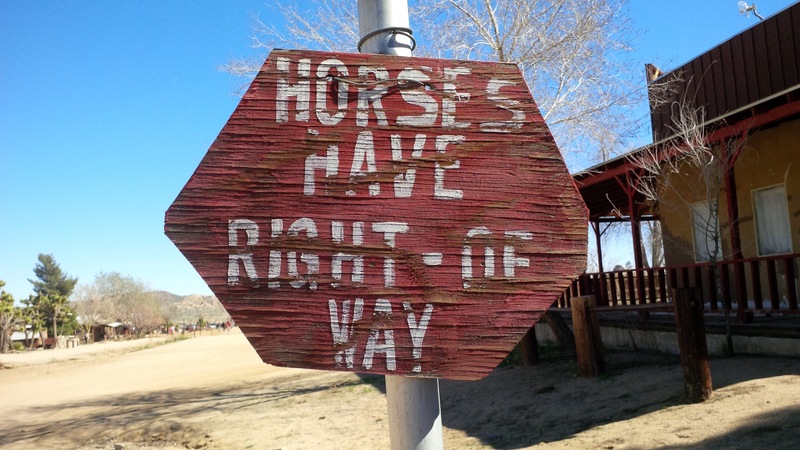 Pioneertown is about 4 miles west of Yucca Valley, California and 124 miles east of Los Angeles, CA. It was built in the 1940 as a live-in Old West movie set. They built the town with the typical buildings you would expect to see in an Old West movie with stables, saloons, jail and houses. The most interesting fact is that all of the houses used were also live in quarters for the actors while they were on set. They filed several Westerns movies and early television show such as The Cisco Kids and Edgar Buchanan’s Judge Roy Bean. They even build a bowling alley called Pioneer Bowl in 1949. The bowling alley had six-lane and Roy Rogers (Russ’ idol) rolled the first ball when it first opened. They even hired school-age children as pinsetter until the installation of the automatic pinsetting equipment. Gene Autry frequently taped his show at the bowling alley. According to the Morongo Basin Historical Society, it is the one of the oldest continuously used bowling alley in California. 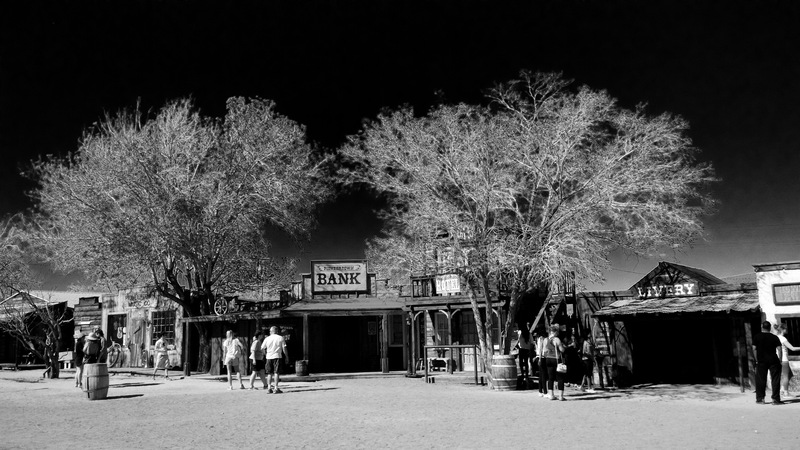 Now a day, you can head out to Pioneertown to enjoy the famous mesquite barbecue, live music and dancing on the weekend. Off and on since 1972, the restaurant has been providing foods for all kind of bikers. Then in 2003, a couple of New Yorker bought the place and returned its glory day. It is now a haven for indie rock favorite with musicians from Robert Plant to Leon Russell have played there. If’s a too long of a ride, you also have the option to stay the night at the 18-room lodge on site. Each rooms are individually decorated in rustic cowboy themes with names such as “Annie Oakley” and “John Wayne”. They also have 17 corrals if you’re into the other kind of horse power. All in all, it was a beautiful day for a ride with good friends. Thank you Ranch Riders for putting on another great ride. Umm…Mr. Mayor? Can you please hurry up? We gotta go! At least you rode that all that matter. My day will come where I’ll have to be riding in cold weather with heated gloves and vest. What brand do you use? Gerbing, absolutely fantastic and with a good no argument warranty. I have no relationship with the company other than as a very happy customer. Thanks…I’ll check them out…need to get a set…let’s hope they have women’s size. I’m sure they do and I’m sure you’ll be pleased with them. Aww…now visiting you is one thing but riding is another. I’ll back up in your neck of the woods when it is warm again. Wow..so awesome. My dream is to ride through the American South West. I find it fascinating, maybe because it’s so different from everything I’m familiar with? Maybe your dreams become a reality someday. If it does, feel free to look me up if I’m not on the road to somewhere. The Ranch Riders always seem to have a good time when we go out, I’m glad you could make it…. Yes they do and thank you for leading us! Looks like another great ride, I’ll trade you a little snow for a little of your sunshine! Oh heck no…had to spend a week in South Dakota for work…that is enough snow for me!